Born in Iceland 1947, grew up in Reykjavík. Discovered The Beatles and entered the music scene with a guitar in hand in a rock band for a few years - guitar is still around. Moved to Eastbourne, England for a year to think about life. Studied to Carpenter Journeyman. Did furniture and construction work in Iceland and Greenland - greatly influenced by the nature of both countries. Moved to London 1972 to study design - a lifelong passion from the age of twelve - graduated as Furniture- and Interior Designer from the London College of Furniture. Work in architects office in Carnaby Street and England's blooming design scene was great inspiration when setting up office in Reykjavík Iceland in the year 1980. 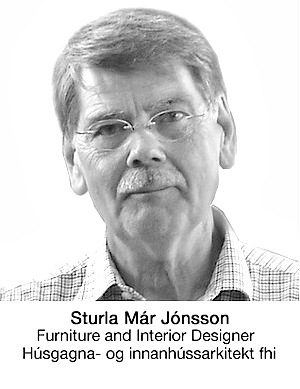 Living in Iceland with a loving family - working on various assignments with furniture design as main activity.